Recordais este post? pues ayer me entere por casualidad de que he ganadado el concurso de DESAFIO DSCUENTO!!! No puedo estar mas feliz y agradezco muchisimo tanto al equipo Dscuento como a los jueces por elegir mi look!!! Y muchisimas felicidades tambien a los otros tres ganadores!!!! Ya os enseñare mis compritas que hare en Asos, porque aun no tengo muy claro lo que voy a elegir. LLevo muuuchisimo tiempo queriendo este reloj de Michael Kors, asi que seguramente sera una de mis elecciones! GRACIASSSS!! Do you remember this post? 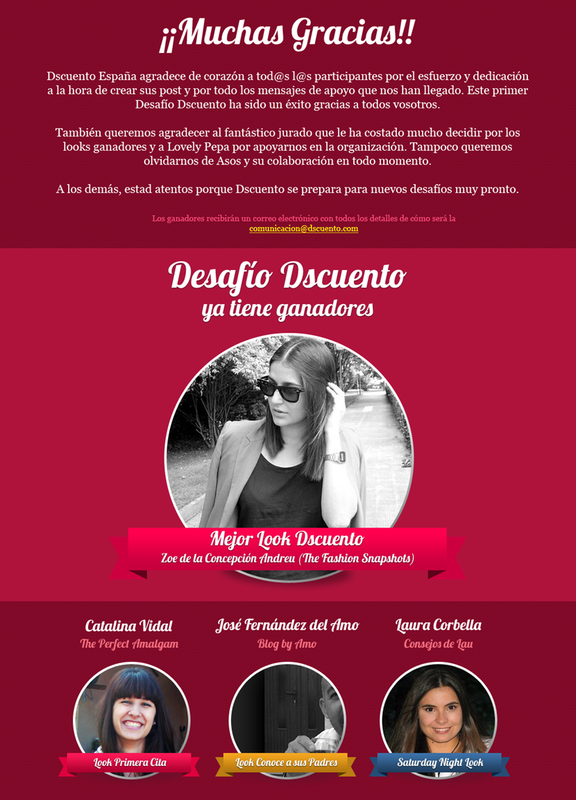 Well, yesterday I knew that I won the DESAFIO DSCUENTO contest!!!! Can't be more happier with this notice and I thank to the Dscuento team and to the jury for choosing my look! Congrats to the other three winners!!!!! I'll show you the things I'll buy at Asos, cause I'm not sure at all... I want so badly this Michael Kors, so it will be one of my choices for sure!! THANKSSSSSSSS!!! I have very hard month in school and work, and I don't have time for blogging, but soon I want change that, kisses to You Zoe! Yay!!! Congratulations Zoe! I am so thrilled for you, you totally deserved the win, well done! Bonita!! Te he enviado un correo al email que hay en la información! Un besazo! Felicidades por haber ganado el desafío. Los looks que he visto me han gustado mucho, incluido el de conoce a sus padres.